Forms spectacular clumps on dead wood. 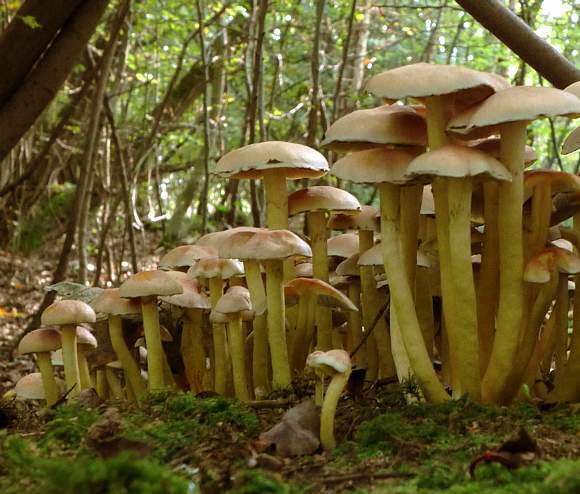 Cap is smooth and matt, yellowish going darker to orange near the centre, up to 7cm across. 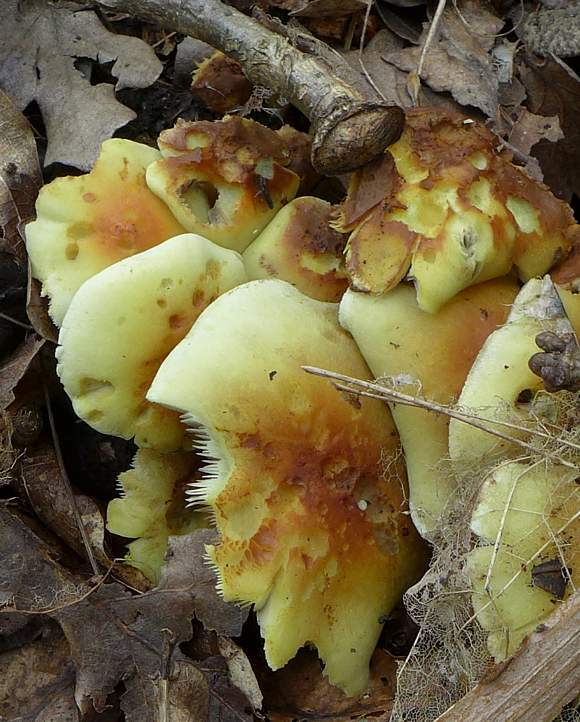 Stipe up to 9cm long, often curved and concolorous with the cap, darkens towards the base as it ages. 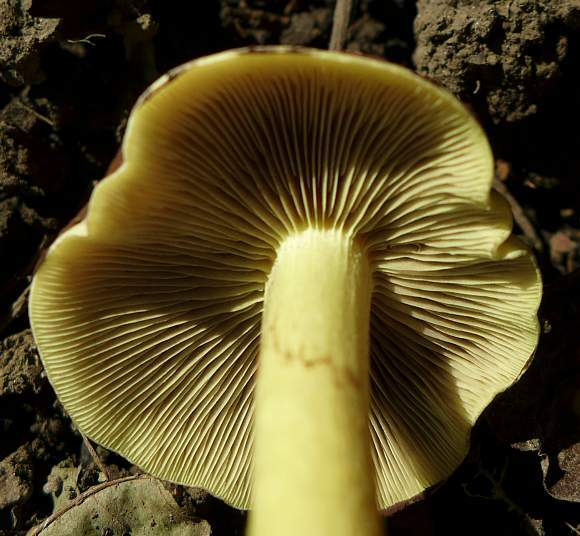 Gills are crowded and adnate, a distinctive yellow-green in colour turning purplish-black. The spores are brown and often cling to the remains of the veil in the so-called ring zone. 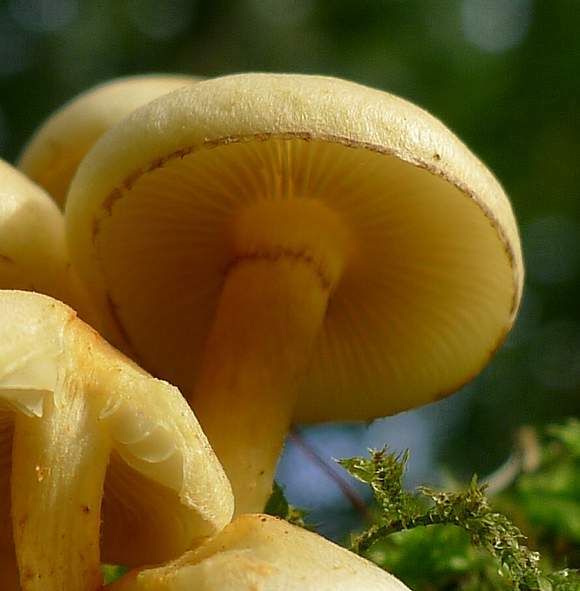 Some similarities to : Parrot Waxcap . 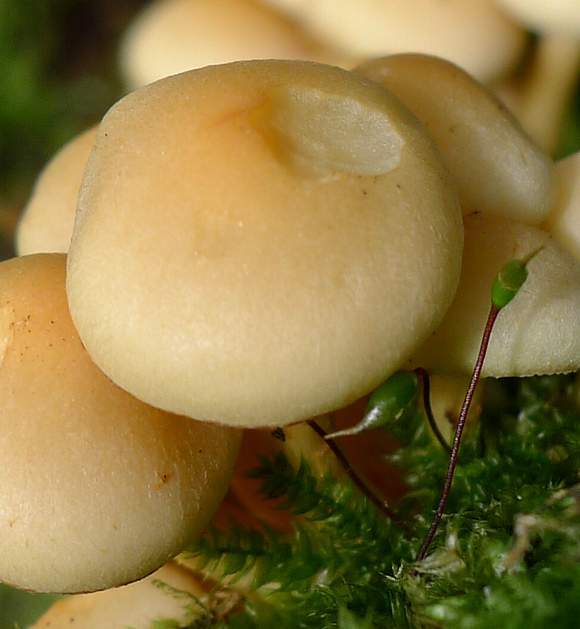 Slight resemblance to : Conifer Tuft . Distinguishing Feature : Yellowish-green gills. 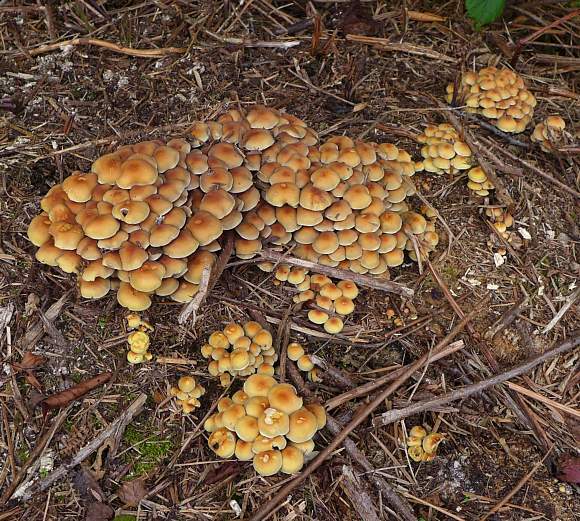 It is poisonous, containing two triterpenoid alkaloids Fasciculol E and Fasciculol F, both named after the scientific name for Sulphur Tuft itself. 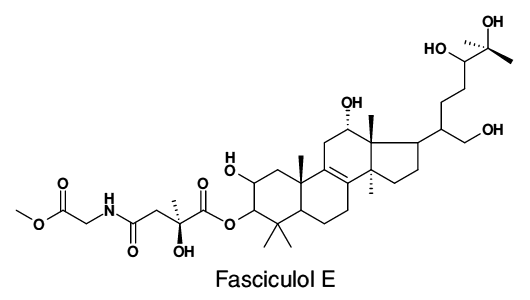 These two fasciculols differ from one another only by the position of the nitrogen-containing chain on the left, which is similar to an N-acyl amino acid. The damage to the liver resembles that due due Amatoxin poisoning. 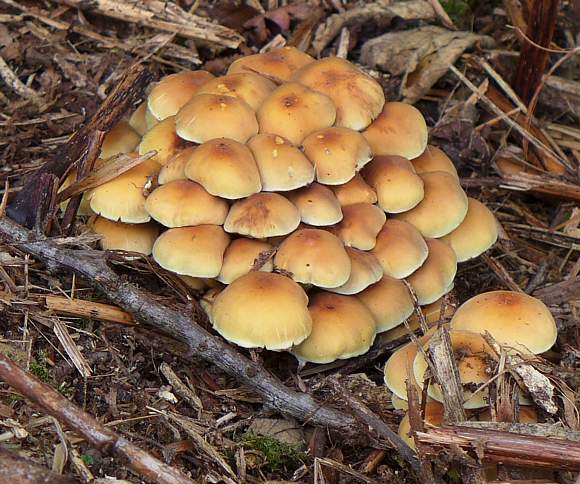 Fasciculol F is also found in another similar mushroom, Brick Tuft Hypholoma lateritium (aka Hypholoma sublateritium aka Naematoloma sublateritium) which is brick-red within (not visible from the outside). 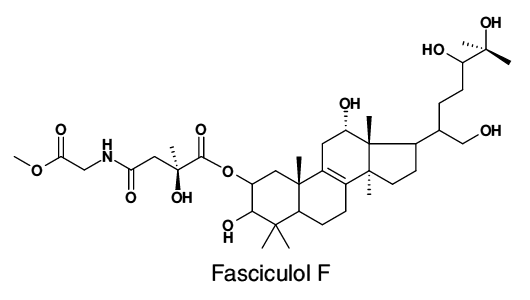 Fascucilols are allelochemicals, which are able to suppress the growth of surrounding plants, a ploy the mushroom uses to its advantage. 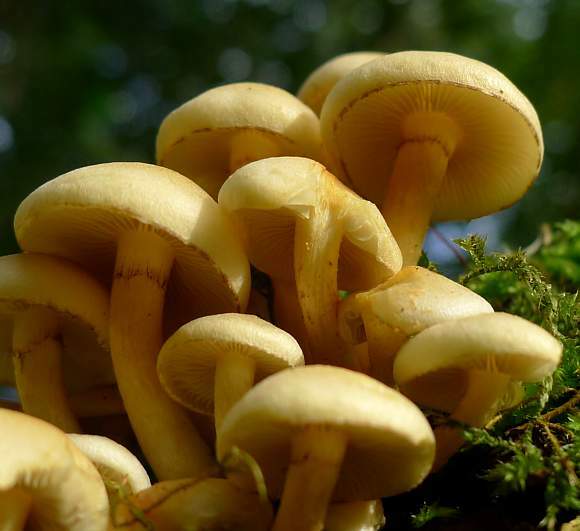 Several mushroom species produce differing non-proteinogenic amino acids (NPAAs) such as the branched chain on the left, or other NPAAs such as Azetidine-2-carboxylic Acid, 2-amino-5-chloro-4-pentenoic Acid and 2-amino-3-cyclopropyl-butazoic Acid .